Square organizers waste space and should be used only when necessary. Shallow bins are particularly helpful in drawers because of their volume, and installing clear organizers makes it easier to see what you’re looking for. Helper shelves – These fit between shelves to increase usable space in your cabinets. Stepped shelves – These help you view what’s potentially hidden in the back of deep cabinets. 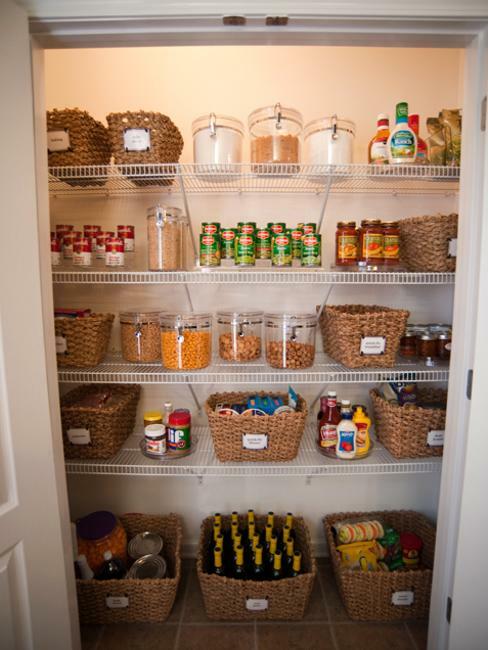 Under shelf racks and baskets – These are good for storing small items and slide in and out easily. Over the door organizers – These come in the form of trays, baskets, towel bars or bag holders, which may be hooked onto the door for quick organization. If you have a lot of pots and pans, you’re likely running out of space in your cabinets for them. Instead of trying to push everything to fit in a cramped space, you can hire a handyman to hang a handrail and some S-hooks for your cookware. Handrails support a lot of weight and S hooks are good for a wide variety of pot and pan handles. You can also buy a pot rack from a home improvement store and have it professionally installed in the ceiling. 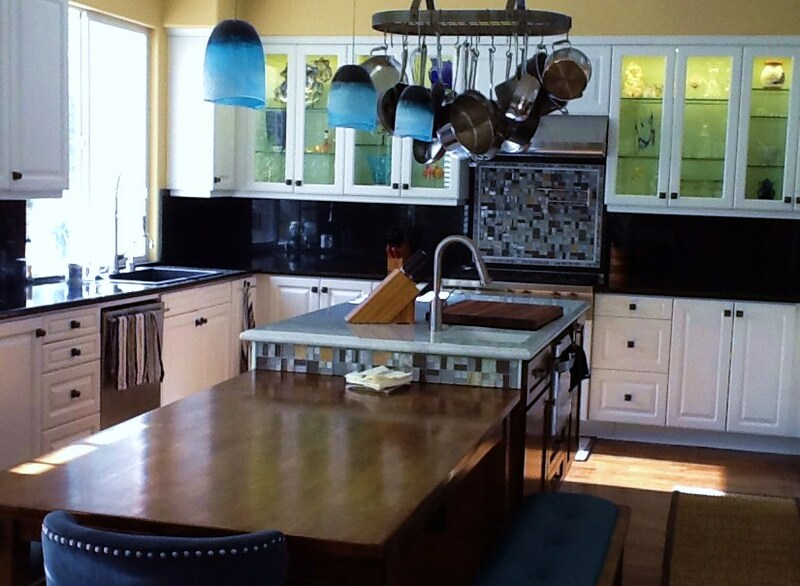 This is a really good idea if you have a breakfast bar or butcher block in the center of your kitchen. It cuts down the chances of you hitting your head on the pots and pans. #5 Organize the sink cabinet. It would be great to utilize your under-sink storage space, but you don’t want it to get cluttered with cleaning items and linens. You can hang hooks inside the sink cabinet door to hang your gloves and some linens. You can also place a tray at the bottom of the cabinet to store cleaning supplies in an organized fashion. It’s quick and efficient -- and it keeps your cabinet space clean. Sometimes you have long cookie sheets, pizza pans and other flat cookware that doesn’t fit right in your cabinets. While you have some space underneath the oven for these items, it might not be enough. So, you need to utilize other space options, which is where plywood panels come in. By removing the lower shelf of your cabinet, you can use a plywood panel that you stand up vertically and brace with wood glue. 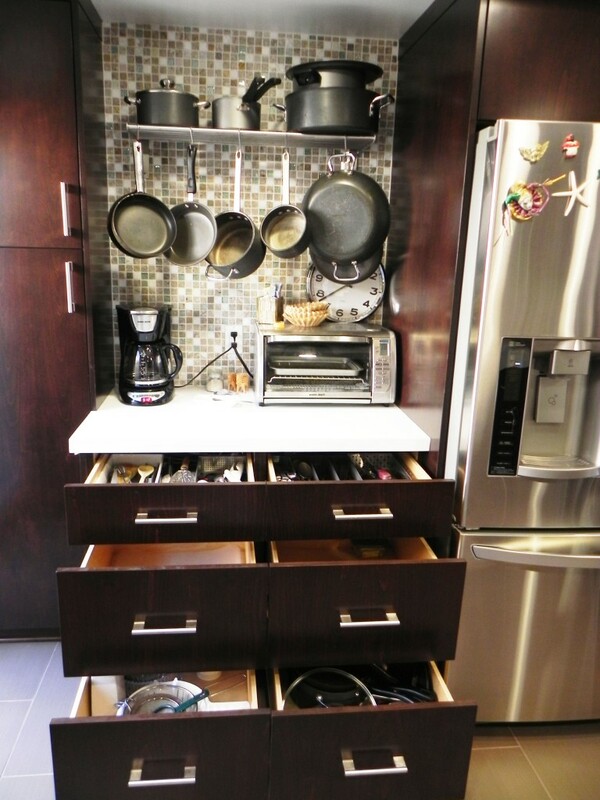 Then you can slip in tall pans easily without them leaning against other items in the cabinet. You might need the help of a carpenter to properly size the plywood panels or drill the appropriate holes for the braces.